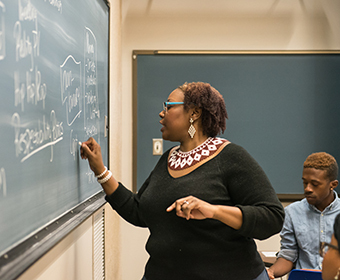 UTSA professor Kinitra Brooks uses comics, social media and podcasts to teach complex theories. (Jan. 30, 2018) -- Two new courses this semester will challenge students at The University of Texas at San Antonio (UTSA) to think critically about theories of gender and race through the lens of popular culture, science fiction, fantasy and horror. Students will also study how those theories play out in the upcoming Marvel Studios film Black Panther, based on the popular comics. Brooks said she wants students to think critically about the characters and meaning behind them as they prepare to see the film together as a class when it’s released in February. In addition to reading the comic books, students will be required to read classic literature and novels such as The Ballad of Black Tom by Victor LaValle, Dread Nation by Justina Ireland and Children of Blood and Bone by Tomi Adeyemi. Students will create podcasts, short films and write short analytical papers each week. Students will complete their media projects in a new digital humanities lab Brooks created with a small technology grant from the UTSA Office of Information Technology (OIT). Another requirement for students will be to create podcasts and work on short papers each week. “I want UTSA students to know how to create media, analyze it and be better critical receptors of media,” said Brooks. Brooks’ course ties in with the 11th annual African American Studies Symposium called Black & Brown Futures in the Denman Ballroom in the Student Union (SU 2.01.28) on Thursday, February 22, 2018. The free event will give UTSA students and the community the opportunity to meet and hear national scholars talk about current research and academic trends relevant to the lives of African Americans in the United States. Brooks is a world-renowned faculty member at UTSA, known for incorporating popular culture into the classroom. In the fall of 2016, her course “Black Women, Beyoncé and Popular Culture” made headlines around the world and was featured in Time Magazine, Los Angeles Times, Vogue Australia and MTV France. During that course, Brooks incorporated Beyoncé’s “Lemonade” album as a springboard for discussion to help her students understand complex theories of race, gender and sexuality. Brooks is an associate professor in the UTSA Department of English. Her research areas include, black women in horror, feminist theory, science fiction and fantasy, black women in popular culture, 20th Century African American and Afro-Caribbean literature, Black speculative studies and Afrofuturism. Last year, Brooks published Searching for Sycorax: Black Women’s Hauntings of Contemporary Horror. Learn more about Kinitra Brooks. Learn more about UTSA Department of English. Learn more about African American Studies Symposium.